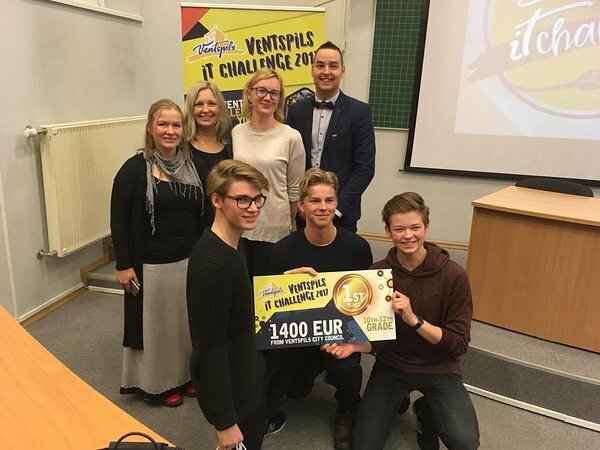 #HITSA | Estonian students were successful at the ICT contest "Ventspils IT Challenge 2017"
There were altogether 1848 students involved in the competition, with 316 students from Estonia. The competition had two rounds. After the first, open round 18 teams from each country were selected to participate at the finale round in Ventspils. In the finale of the IT challenge the participants were actively solving given problems and tasks related to smart use of web, digital skills and presentation skills.They also participated in different entertaining activities and got to know the city of Ventspils through excursions. Students competed in four age categories. In the category for 10.-12. grade the Estonian team from Pärnu Sütevaka Humanitaargümnaasium -- Karl-Enrik Kriis, Erik Vipre, Tom Suiste – won the first place. All the teams were evaluated by the jury, which consisted of representatives from the Ventspils Digital Centre, the task group and experts from Latvia, Lithuania and Estonia. ​The competition was organised by the Ventspils Digital Centre and supported by the Information Technology Foundation for Education (HITSA) from Estonia and the Network of Innovative Informal Education for Youth (INPUT) from Lithuania.